Burton Elementary has a long history of success and is further banding together with the community to support students and their families. These efforts, however, are being jeopardized by the state's emphasis on standardized testing practices that unfairly penalize schools serving primarily English language learner communities, writes Saúl Ulloa, an alumnus of Burton and a longtime resident of the Burton Heights and Garfield Park area. Saúl Ulloa, whose father comes from Mexico, grew up in the Burton Heights neighborhood. He is a product of Grand Rapids Public Schools and attended Burton Elementary, Blandford School, and City High. He is a 2015 graduate of Vassar College with a degree in International Studies & Arabic Language. Ulloa has recently returned to Grand Rapids after spending a year in Amman, Jordan, where he spent time improving his Arabic skills and working with an NGO that provides humanitarian assistance to Syrian refugees. I grew up in the Burton Heights area, just a few blocks from Burton Elementary and Middle Schools. I attended Burton Elementary from 1999 to 2004 and benefited from incredible teachers and supportive paraprofessionals along the way. I was dismayed to hear that the Michigan School Reform Office (SRO) had identified Burton Elementary and Middle Schools as two of the lowest-performing public schools in Michigan. This ranking was based upon the state’s student performance test, the Michigan Student Test of Educational Progress, or M-STEP. These rankings fail to show, however, that the vast majority of Burton students are designated as English Language Learners, meaning students for whom English is not their primary language. This places an extra hurdle in front of parents and teachers to provide a quality education for their children. I am from a somewhat bilingual household but primarily grew up speaking English. This gave me and my family immense amounts of privilege. I did not have to learn English while learning math. I did not have to learn how to read a language I did not even speak. I did not have to translate for my mother in parent-teacher conferences. However, these are the experiences of many of the students at Burton. Throughout my time there, I remember most of my classmates were either bilingual or did not speak English very well. 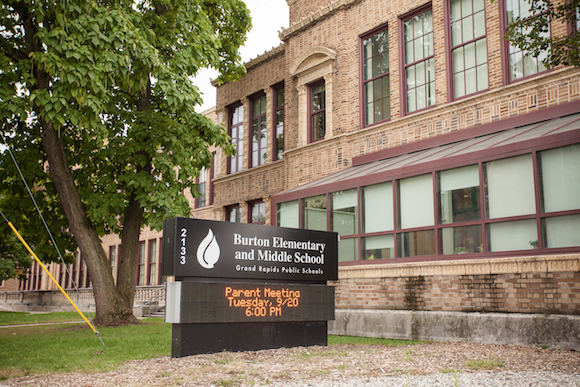 According to Burton Elementary’s 2016-17 School Improvement Plan, 96 percent of Burton Students are Latinx, coming from Mexico, Cuba, Guatemala, Honduras, the Dominican Republic, and Puerto Rico. The vast majority of these students speak English as their second language. The SRO’s designation of Burton as a failing school is troubling and complicated. If students are tested in a language they do not speak, then they probably will not score well. The state does not take into account students’ English language proficiency when tallying the scores, leaving schools like Burton, and many others in West Michigan, to appear as though they’re failing. It seems unwise to threaten school closure based on a test the students were, essentially, destined to fail. (The SRO has said it will use the list of low-performing schools in Michigan to decide if it will close any of the institutions. This decision is expected to be made by the end of the school calendar year.) These children are not unintelligent nor lazy; they are simply being held accountable for information in a language many of them have only recently learned. Fortunately, most of the teachers at Burton are bilingual and can provide support in the student’s native language, while maintaining an emphasis on their mastery of English. The National Center for Fair and Open Testing reports that it can take five to seven years for students to become proficient enough in academic English to understand test questions. Despite these challenges, the school is constantly looking at ways it can better support its children. Burton currently partners with 15 social service, medical and educational agencies to promote the well-being and success of its students. A Department of Human Services office was included in the school’s 2008 remodel, removing barriers to accessing social welfare programs such as food assistance and Medicaid. This allowed for parents to use the school as a one-stop-shop in addressing each student’s needs. The school aims to remove all conceivable social barriers in order to ensure the success of each child by remembering that they do not live in a bubble. The students are affected by the economic, political and social conditions under which they have grown up. According to Burton Elementary’s 2016-17 School Improvement Plan, 100 percent of the school’s students are eligible for free and reduced lunches and participate in a sack supper program from Kids’ Food Basket , a nonprofit organization that provides free dinners to underprivileged children. A hungry child does not become full simply by going to school. Burton has also fostered relationships with several local and national charities to improve its capacity to teach students effectively. Burton has received an Apple ConnectED grant that gives an Apple laptop and iPad to every teacher and an iPad to every student, for educational purposes. Burton was also one of three GRPS recipients of a $40,000 Mejier Good School Grant to hold a series of workshops detailing the importance of parental involvement in oral language acquisition. In an interview with a recent Burton parent, Juan Ramón Hernández, these language programs were viewed positively. “Burton has many programs where parents learn a lot, too. I was learning a little English there and I still use a lot of the information I learned in those classes," Hernández says. Burton seems dedicated to functioning as both a school and a community center, addressing the most pressing needs in their students' lives. “If I could go back in time, I would definitely put my child back at Burton," Hernández says. 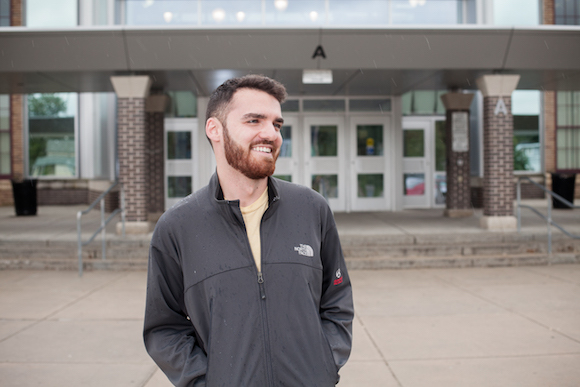 "I got along well with the teachers and always saw them at parent-teacher conferences.” The Burton staff are seen as genuinely caring about their students and the communities they come from. This holistic educational model ensures that trust forms between all interested parties to support the Burton children. The school has implemented the LOOP after-school program, providing additional educational enrichment during the hours when parents are still working. This allows students to receive extra help with their homework and ensures they remain in a safe and stable environment as long as possible. I attended this program as a student and benefited greatly from the additional educational enrichment. I felt secure with the dedicated LOOP volunteers and gained a lot of valuable experiences in the program. I visited the local zoo for the first time in fourth grade, and we took summer field trips to Chicago. I was shown that there is a world beyond Burton Heights. I could see there was more than just Grand Rapids. My family’s economic circumstances did not have to keep me from accomplishing my dreams. I hold very fond memories of my time at Burton Elementary. The teachers and staff there encouraged me to believe in myself and to believe in my future. As a result of their dedication to my education, I have been pretty lucky in my professional and educational endeavors. However, I entered the school with an incredible privilege: English. The students at Burton are just as intelligent as kids elsewhere. The teachers at Burton are equally as capable as staff in other schools. The resources available to students and their families demonstrate a unique dedication to the Burton Heights community. However, tying the future of the school to a test in a language many students are still learning undermines all the extraordinary efforts students, parents and staff put in every day. Follow On The Ground GR's work via Twitter (use the hashtag #OnTheGroundGR), Facebook and Instagram. To connect with On The Ground GR's editor, Michelle Jokisch Polo, you can email her at michellejokisch@gmail.com and follow her on Facebook and Instagram. You can learn more about Michelle here.